Outlet glaciers on the perimeter of the Greenland Ice Sheet continuously feed fresh water into the Atlantic Ocean at the zone where the cryosphere, hydrosphere, and atmosphere meet, a highly complex and insufficiently understood area. A large-scale remote sensing project was recently developed by a group of researchers from Lamont-Doherty Earth Observatory, Harvard University, the University of Maine, and the Institute for Space Sciences in Barcelona, Spain, with the aim of using GPS to better determine the dynamics of the glacial flow of these outlet glaciers. UNAVCO provided support for both the development and field portions of the project. This study focuses on Helheim and Kangerdlugssuaq glaciers, which are located on the South-East coast of Greenland and together drain approximately 8% of the Greenland Ice Sheet. The project proposed to install 30 single-frequency (L1) GPS receiver systems equipped with radio communications on each glacier for a 15-month period from June of 2008 through August of 2009. The data are stored locally at each receiver site and transmitted to one of six nearby dual-frequency GPS sites located on stable rock out-crops above the glaciers. Each rock-site will be equipped with a small computer to manage communications and store all incoming data, and with satellite (Iridium) communications that will transmit all data back to UNAVCO. The dual-frequency data recorded at the rock sites ware used to obtain space and time corrections for the L1 ice data. While the US and Spanish researchers developed the software, firmware, and communications portions of the project, UNAVCO created designs for and fabricated both the L1 ice-site enclosures and dual-frequency rock-site stations. 20 dual-frequency receivers from the UNAVCO pool were deployed on Helheim and Kangerdlugssuaq glaciers in June in order to collect a complete set of data for the summer. Four dual frequency rock sites were also installed on the nunataks in between the glaciers in June. Development efforts continued through July, and in mid-August, the 20 dual frequency receivers were pulled from the glaciers, returned to UNAVCO, and replaced by 10 L1 systems. The units showed initial success in relaying data from the glaciers to the rock sites via radio communication, and then to UNAVCO via Iridium communication, but more development work is needed before the system is declared operational. The group will continue to develop the software and firmware throughout the fall, winter, and spring, with an anticipated deployment of the remaining units on Helheim and Kangerdlugssuaq glaciers at the beginning of the summer of 2009. The units that are already on the glaciers and software at the rock sites will also be upgraded at this time. Data will be collected all summer long and relayed back to UNAVCO as planned via Iridium satellite communications. 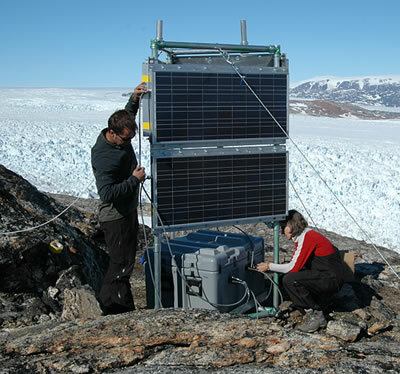 Figure 1 - Researchers Gordon Hamilton and Meredith Nettles install a GPS station on a nunatak on Helheim glacier. The station will receive data from several GPS units on the glacier via radio signal, and then transmit the data back to UNAVCO via Iridium communications. 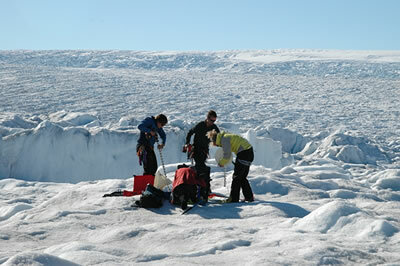 Figure 2 - The group installs a GPS system on the Helheim glacier in June of 2008. The systems were designed by UNAVCO to be durable in a Greenlandic glacial environment and easily installed under a rotating helicopter in less than 5 minutes.